When the Berlin Wall fell and East and West Berlin were unified once again, one thing remained unchanged: the city’s famous landmarks, the Brandenburg Gate and the Kaiser Wilhelm Memorial Church at Breitscheidplatz, in the West of the city. 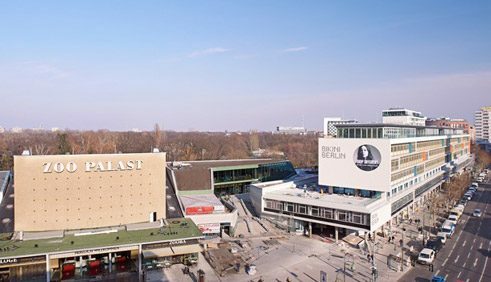 The district of Charlottenburg around the Kurfürstendamm and Bahnhof Zoo has, however, lost some of its economic weight and has slipped out of the spotlight as the cosmopolitan centre it once was when Berlin was divided. In the mid nineteen-fifties development had to move fast because in 1950 powers in East Berlin had already started to divide the city. “Berlin must become a showcase for economic prosperity” Ernst Reuter, the first Governing Mayor of West Berlin once said in 1949. West Berlin had to have its own city centre. Before it became West Berlin’s main station the stop Zoologischer Garten had been a through-station with just 4 platforms. The Zoo itself had to sacrifice some of its grounds to make way for a square in front of the station. It was then the architects’ turn to redesign the square on the southern edge of the Zoological Garden. A major role in this development was to be played by the Zentrum am Zoo and the Bikinihaus. Construction work on the 24 million deutschmark project began in 1956 and was financed with the support of the Marshall Plan. 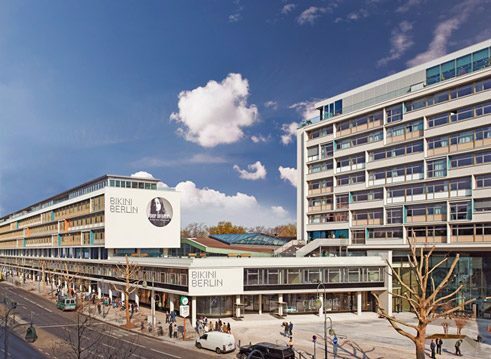 The women’s clothing industry that had been forced to leave the Spittelmarkt in Berlin Mitte was to be given a new site for its production and business facilities at Breitscheidplatz. The architectural approach of the successful Berlin architects Paul Schwebes and Hans Schoszberger was without compromise. This design was to exude modernity. It was to put an end to the pompous style of Kaiser Wilhelm and the severe neoclassical architecture fostered by the Nazis. It was also to spell out to the East the meaning of “Freedom” in architectural form. 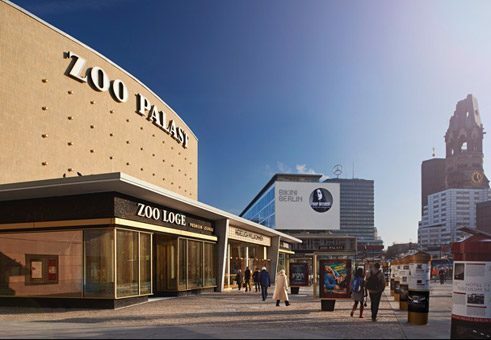 Two high-rise buildings, the Zoo Palast Cinema and the 180 metre long span of the Bikinihaus created a finely balanced ensemble with delicate structural elements and transparent, predominantly glass facades. In the Bikinihaus the architects opened up the sides of the second storey and turned the building into a two-piece garment with a bare-naveled view through to the Zoological Garden. 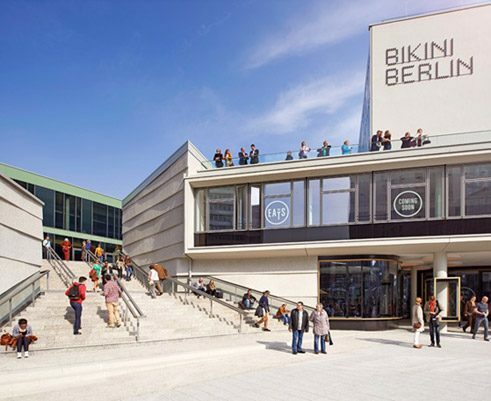 The people of Berlin thus nicknamed the building Bikinihaus. This feature ended in 1977 when the open-sided storey was closed in to house an art gallery. After the reunification of Germany all activities then focused on the area of Berlin Mitte, meaning that the centre of West Berlin was no longer such a hotspot. 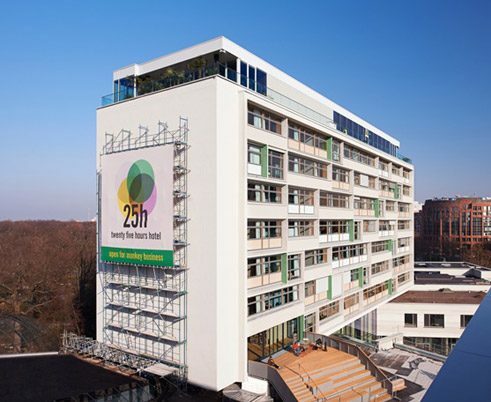 Recent efforts to help the district of Charlottenburg catch up include the extensive and authentic renovation of the Zentrum am Zoo. The Munich architects Hild und K took over the problem-prone project from the Belgian artist/architect Arne Quinze and successfully finished the job. Today the facades demonstrate extraordinary elegance once again, and one just has to ask how this could have been lost. Intricate solutions had to be found to maintain the exposed concrete structures in all their delicacy and at the same time allow an energy-saving upgrade. The outer walls have now been replaced and the steel windows reproduced in an aluminium design, leaving them with exactly the same appearance. The north side that faces the Zoological Garden has, on the other hand, undergone a complete metamorphosis. Once a yard for supply deliveries and access to the multi-storey car park, this area now accommodates a trendy shopping mall with views to the monkey enclosure. 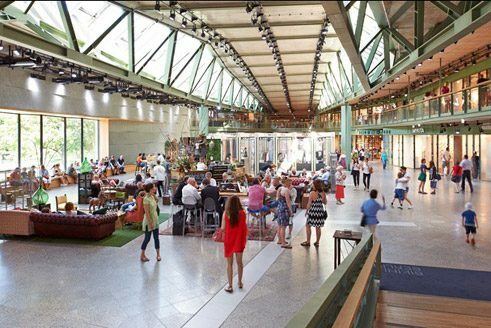 Although Berlin has some five dozen shopping centres, this specific concept is considered sensational. Designed rather like a market hall and fitted out in wood, here constantly changing designers present their creations under the careful coordination of Andreas Murkudis. 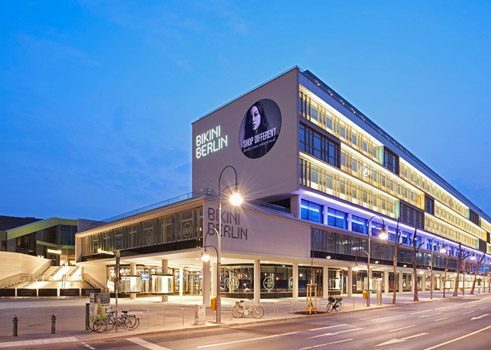 Stylish fashion boutiques and exclusive brands complement the scene and are aimed to establish Bikini Berlin at an above-average level. 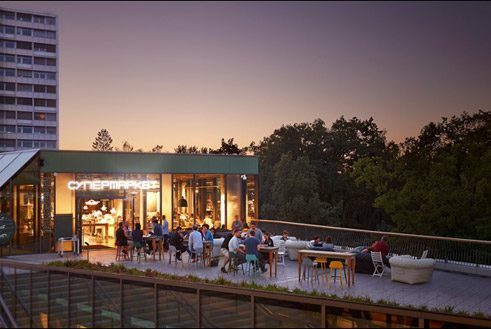 The large roof terrace is a major attraction with restaurants, cafes and view across the Zoological Garden. This view is also to behold from the already very popular Monkey Bar on the top floor of the small high-rise building that accommodates the trendy 25hours hotel. 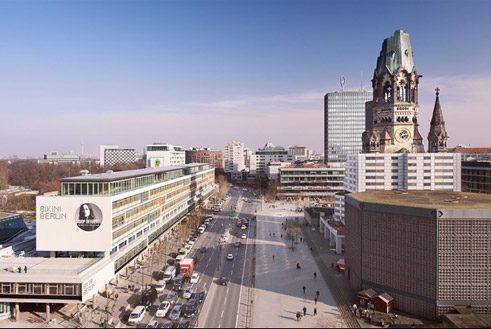 Together with its neighbouring buildings of the same era, the Zentrum am Zoo and the Kaiser-Wilhelm Memorial Church built in 1960, with its significant broken shard, coined the cityscape of West Berlin. Now, with the new Waldorf Astoria hotel tower and a planned “Upper West” high-rise, this scenery is set to change once and for all. There is still a lot of controversy as to whether these new urban highlights will be able to form a harmonious ensemble. Falk Jaeger is an expert on historic buildings and critic of architecture in Berlin.